Russia and China on 7 March signed the general contract for construction of units 7 and 8 at the Tianwan nuclear plant in Jiangsu province and the contract on basic design for units 3 and 4 at the Xudabao nuclear plant in Liaoning province. The contracts were signed in Beijing by Atomstroyexport, the engineering division of Russian state nuclear corporation Rosatom, and enterprises of China National Nuclear Corporation (CNNC). Previously, Rosatom and China signed a protocol on cooperation and a framework agreement on serial construction of power units for the Xudabao plant. The plan is to build two power units with Russian designed generation 3+ VVER-1200 reactors. The agreements also stipulate the possibility of constructing more units in the future. Rosatom said the contracts were based on a package of strategic agreements signed during a visit by Russian President Vladimir Putin to China in June 2018, which specified the construction of two VVER-1200 reactors at each site. 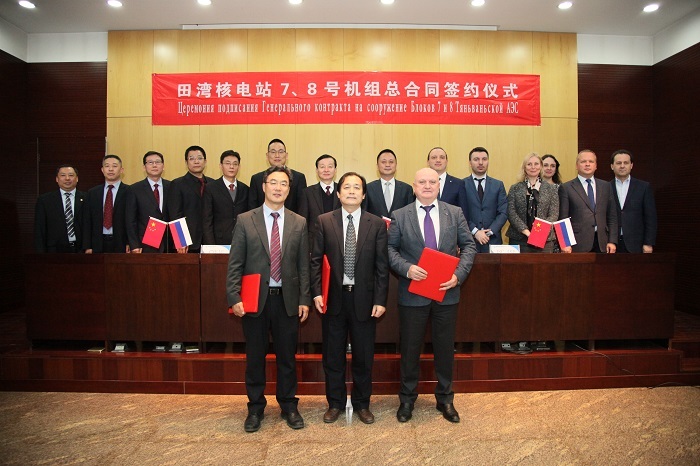 CNNC and Rosatom signed contracts for Tianwan 7&8 in November signalling implementation of the framework contracts. The first phase of the Tianwan NPP (units 1 and 2) was based on a 1992 cooperation agreement between China and Russia. First concrete was poured for Tianwan phase 1 in October 1999, and the units were commissioned in 2007. The second phase comprised Tianwan 3, launched in 2017, and Tianwan 4, launched in 2018 – all Russian AES-91 VVER-1000 reactor units designed by Gidropress. Phase three (Tianwan 5&6) are Chinese-designed 1080 MWe ACPR1000 scheduled to begin commercial operation by the end of 2021. The Xudabao project was initially expected to comprise six Chinese-designed CAP1000 reactors, with units 1 and 2 in the first phase. Site preparation began in 2010 and the National Development and Reform Commission approved the project in 2011. The National Nuclear Safety Administration (NNSA) approved the site selection for Xudabao 1&2 in 2014. In April 2014, the site was approved for construction of two Westinghouse AP1000 nuclear power units with the option of building four more units. However, these plans have since been dropped in favour of Russian plants. Rosatom hopes to commission the units in 2027-2028.